The biggest changes seem to be the cape, which is now a less floral looking cloak, a hood a la video game Assassins Creed, and a menacing grimace even Batman would be proud of. On the changes from DC's Source blog, Johns states "Gary and I will be focusing on the magic hero instead of the super hero...We're telling the story of the hero's young alter ego, Billy Batson, a foster kid at a crossroads in his life. The question is, how does the emotional journey of this troubled teenager collide with the fate of the world?" What do you think? Is this just one panel where the usually bright and dynamic hero needs to turn it on to warn evil to stray from it's current path, or is this how Cap er Shazam will act from this point forward? Me, based on all the great work Johns did on the character prior to the 52 reboot, I'm hoping it's the former, but only the pages of this month's Justice League #7 knows for sure. ToB, yip it sure is a lot darker hen I thought they'd go, but who knows... like Marvel recently ran X-Factor Forever, etc maybe we will get a Pre 52 Forever title too. Still role on Justice League #7 for the full story! Hmmm....intriguing. I shall have to investigate further. the big red cheese becoming an adult or a mature teenager. GREAT! Shazam doesn't have to be Batman but it would be good if he grew up. The best Shazam scene I ever read OA was in the pages of Final Crisis, and it pretty much took on panel. He was a more confident Billy then I'd seen, but boy it stole the show for me. 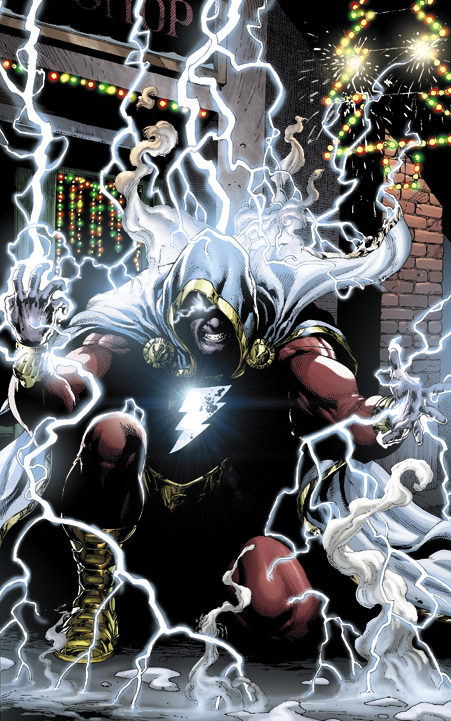 Here's hoping it's street smarts and maturity, not angst this Shazam delivers! it's got a slightly more Egyptian look to it. I don't know, I'm kind of liking it. Well Craig - seems this post has fans on all sides! I'm glad they stuck with the lightning bolt on the chest and the colour scheme. Had that gone I'm pretty sure the feedback would've been more one sided!